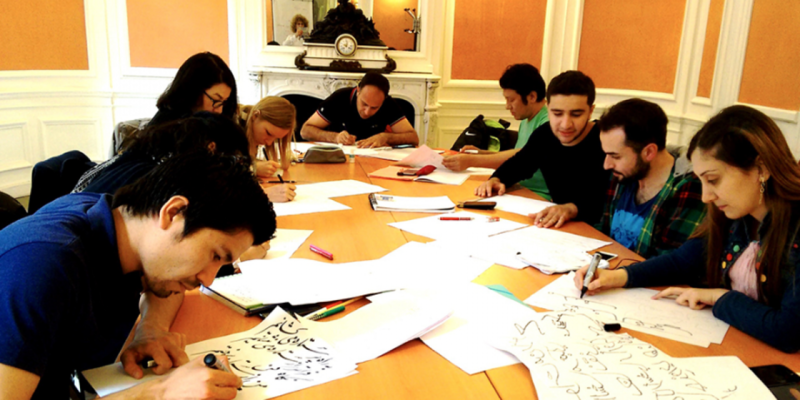 Paris, 19 July 2016 – JRS France held a poetry evening with refugees from a number of different countries. Here, Anne Kempf, a French teacher working with JRS, recounts the experience. Noura, Alaa, Yasin (Syria), Elena (Ukraine), Tenzin (Tibet), Tasnuva, Yasin, Alam (Bangladesh), Saeed (Iran), Mariam, Khyber (Afghanistan), Hamid (Iraq) each participated. The twelve asylum seekers and refugees of the JRS French classes are all dressed up for the evening of poetry. They invited the families lodging them in the JRS Welcome network and the volunteers helping them with French. This first poetry evening was sponsored by Jean-Pierre Lemaire, a professor of French literature, author of many books of poetry, a visiting professor at the Sèvres Centre and himself a JRS volunteer. These students have prepared this first event for weeks with their teacher’s help. When entering the room, people could admire, pinned on the walls, their poems written in Farsi, Dari, Arabic, Tibetan, Russian, and Bengali. A way of showing to the French audience the art of calligraphy in these various languages. Everybody sat around a large table and one by one, began the reading or singing. First they introduced in French the poem or the song they were going to say or sing in their mother-tongue. Then they read or recited poems of famous French poets: Paul Verlaine, Arthur Rimbaud, Guillaume Apollinaire, Charles Baudelaire, Gérard de Nerval. Some of the volunteers also read French poems. Finally, the most advanced students read some of Jean-Pierre Lemaire’s poems they had selected. Poetry won't help them in getting neither papers nor jobs but it celebrates life through words, body and emotions. Poetry is an important part of the French teaching in JRS France. It helps the students to deliver a speech clearly by focusing in a special context on pronunciation and rhythm. It enables them to introduce and share part of their culture, of their country from which they were separated, to get to know the famous great classics of the French literature. And thanks to Jean-Pierre Lemaire, they can discover that a poet is not a person from the past but someone actually sitting next to them. Reading poetry allows to communicate one’s emotions, get valorized and become more confident. Poetry won’t help them in getting neither papers nor jobs but it celebrates life through words, body and emotions. It gives us the possibility to put a name on difficulties, loneliness, sadness, nostalgia, but also to marvel at beautiful things, such as hope and fraternity. Poetry reminds us of our humanity and allows us to express our emotions from the deepest of ourselves.